It looks like we were grilling out back at the Port Authority offices in Heath. 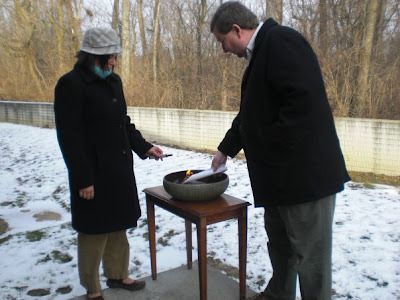 Actually, this was a 10-second photo op while Port Authority Finance Manager Erin Grigsby and I ceremoniously burned the bond for our 2002 land purchase. The bonds were issued to purchase property in 2002 that we call the South Campus of the Central Ohio Aerospace & Technology Center. During the time that passed, we not only retired the debt on the land purchase but were able to construct new roadways and prepare the site for development with no additional debt. Today, we have 250+ acres of "shovel ready" industrial property.